A kinetic slice of neorealistic life, although A Ciambra tells a fully contained coming-of-age story, the sophomore effort from Jonas Carpignano was originally made to serve as a companion piece to his award-winning debut Mediterranea. Fortunately, however, the Cannes Film Festival Director's Fortnight award-winner stands exceptionally tall on its own. Set in Southern Italy's Gioia Tauro, the film chronicles the life and family of fourteen year old Pio Amato, who stars as a thinly disguised version of himself along with the rest of the cast of unprofessional actors (most of whom are Amato's relatives). The grandson of a Romani immigrant who lives with his family in extreme poverty stealing electricity from and working for the rich Italians in the surrounding area, as a petty criminal who longs to be taken seriously, Pio can't wait to grow up. When his father and brother get arrested during a robbery, Pio vows to use the opportunity to become the man of the house and prove them all wrong. Working alongside Ayiva (Koudous Seihon), an older African immigrant who is saving up money to send to his sister and daughter back home, Pio gets to work stealing from tourists. Boldly climbing aboard trains only to leave moments later with a stranger's luggage, the sight of people freely leaving an area that the young illiterate boy most likely never will is a haunting one indeed and part of A Ciambra's power is in just how long it stays with you after it ends. A complex portrait of a multicultural southern Italy where racism, bias, and socioeconomic inequality is at an all time high, although Gioia Taura feels like it's a million miles away at the start of the film, by the end, you realize that the issues affecting the residents there (ranging from prejudice to the disparity of rich vs. poor) are the same ones facing us everywhere, only magnified. Whether Pio's on a train going nowhere or using the guise of a motorbike ride to hug a friend goodbye in a heartbreaking third act twist, as Italy's official Oscar submission for the Best Foreign Film of 2018, Carpignano's moving chronicle of the determined youth's hard-fought journey from boy to man follows in the footsteps of classic Italian and modern global works of Neorealism. 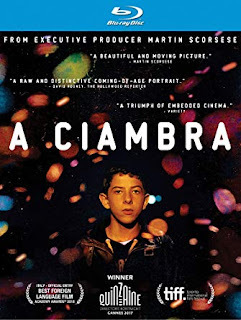 And although Bicycle Thieves and City of God immediately come to mind, the film also owes a thematic debt to other international coming-of-age classics such as Truffaut's The 400 Blows, which A Ciambra appears to reference in a few select shots. While producer Martin Scorsese offered notes on the film's cut, aside from a minimal nod to Magical Realism while paying tribute to Grandfather Amato's past wandering the land, Carpignano treats Gioia Taura and its people with a near journalistic integrity in A Ciambra, unwilling to alter much of what's in front of his eyes in his attempt to bridge viewer and subject. Adamant in his belief that, as he says in the press notes, "exposure to 'foreign elements,' whether they be people, food, or music is the only way to dissolve the artificial boundaries between us," in this microcosm of life in Southern Italy which might as well be life everywhere, Carpignano uses film to do just that. Weaving in a plethora of bonus material from a short film and featurette to lengthy documentaries on the ninety-one day production to bring you the whole story, although it's missing Mediterranea, the gorgeous Blu-ray transfer from MPI and Sundance Selects delivers viewers to Gioia Taura Pio style - with no train ticket required.